Jordan's King Abdullah has said it will be impossible to hold fair elections in Iraq in the current state of chaos. He told the French newspaper Le Figaro that only extremists would gain if the elections went ahead in January without the security situation improving. Correspondents say these were remarkably frank comments from a man Washington regards as one of its key allies in the Middle East. US and interim Iraqi leaders both insist that elections will go ahead. However, last week US Defence Secretary Donald Rumsfeld told senators it might not be possible to conduct voting in some places targeted by militants. King Abdullah was in Paris on Tuesday where he spent an hour with President Jacques Chirac discussing a US proposal for an international conference on Iraq, as well as the planned elections. France has said a conference could be "useful", but only if the issue of a US troop withdrawal was on the agenda and if representatives of the armed opposition were allowed to take part. 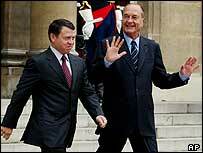 King Abdullah has said he is in favour of a conference, for which Amman has been mentioned as a possible site. The king headed to Rome following the Paris meeting, without talking to journalists. In the newspaper interview King Abdullah said he was worried that partial elections in Iraq, excluding troubled areas such as Falluja, could isolate Sunni Arab Iraqis and create deeper divisions within the country. "It seems impossible to me to organise indisputable elections in the chaos we see today," the king said. "Only if the situation improved could an election be organised on schedule." The king also urged the Iraqi authorities to re-recruit middle-ranking officers of the old Iraqi army under Saddam Hussein and provide longer training for new troops. "The faster we reconstitute the old army, the better the new one will be," he said. "King Abdullah's support comes with conditions"